DarkShadowAxel has started a donation pool! If you donate you will get featured for a month on my page! IF I GIVE YOU A LLAMA PLEASE BE COURTEOUS AND GIVE ME ONE BACK! TRYING TO GET 100K LLAMAS! Meet Salem the witch gal. Adopts are all here! Check them out! Some are free ! Im Raevyn , 24. My fa account is darkrocket. I love to write, draw, and suit. You need to get my permission if you want to use! , have one in return! 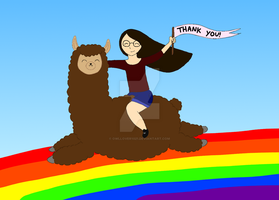 Thanks a bunch for the llama badge!! Thank you so much for the llama badge!